Apart from loose items, there's a buzz that comes from the peghead that's caused by the strings bumping into things, or into each other. In fact, it's nearly impossible to string this guitar so that the fifth string doesn't touch the windings of the sixth on the post. If the string touches in just the right way, it really sings out with a buzzing noise that rings sympathetically with all or specific notes. The bad news is that you really can't relocate the tuner post. The good news is that you don't have to. It's just a matter of being careful with this particular instrument. 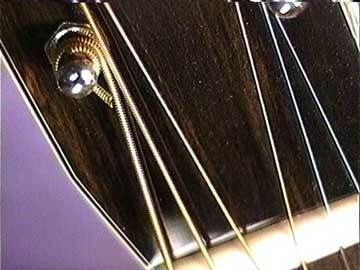 All you have to do is make sure that the fifth string doesn't touch the sixth, by being careful how the windings build up on the two tuning posts. OR, you can make sure that the fifth string rubs firmly against the sixth. Either way, the buzzing stops, and there's no more problem. 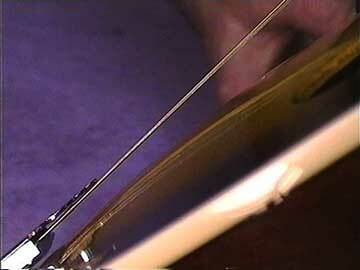 See how close the string comes to touching the tailpiece cover. That's why so many mandolinists chuck the cover and play without it. Others may stuff a bit of felt or leather between the string and the tailpiece. Either solution works fine, and is easy to do. You can usually test for string interference by lightly plucking the string above the nut or below the bridge to hear that little buzz.